WHAT IS IT ABOUT BAGS? 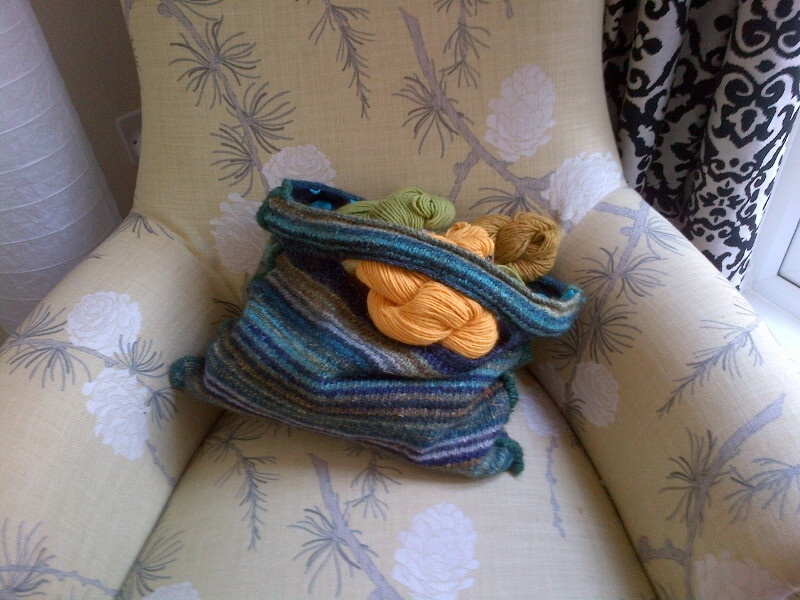 I first started making bags after falling for a self-made duffle on someone else’s shoulder made of beautiful wool stripes in orange, teal and french blue. And now I am hooked. The problem is there are so many patterns out there it becomes irresistible to try them all. Be warned this is not an economical habit. 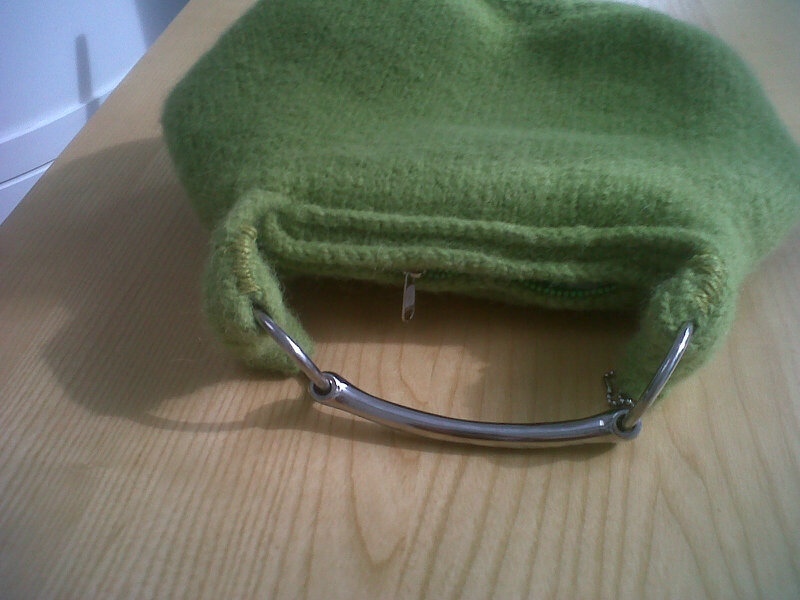 Felting wool means shrinking it which means you are going to use a lot! Then having spent hours knitting you are going to risk throwing your work in the washing machine. And when it comes out it becomes a question of tugging and pulling it into shape and sometimes shaving off any excess pile. But there you are, I do know what it is! For, then, comes transformation! So often, you throw in a baggy piece of knitting and out comes an oddly satisfactory article which is uniquely yours. They can be used to hang on the wall, hold scarves or jewellery or as knitting bags if you are reluctant to take them out. Look first in the Accessories menu. Grommets and cord for duffle bags are harder to find. You will need to search haberdashery sites. As with all felting projects you are mostly best to work with a double strand of a 100 per cent worsted weight wool or use a branded felting wool. Yarns with synthetic fibre content will fail to felt fully. 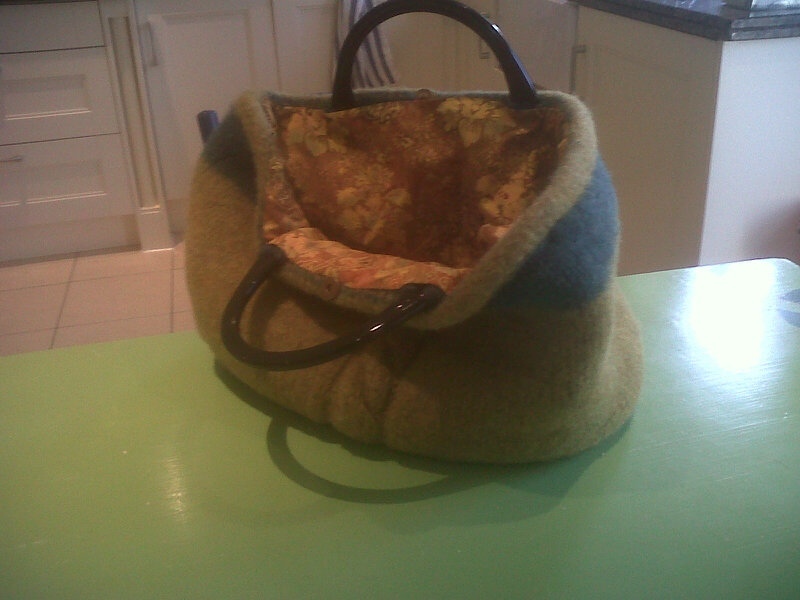 Unfelted, knitted bags don’t work because they are too stretchy so you are looking for a wool which felts to a good strong fabric. 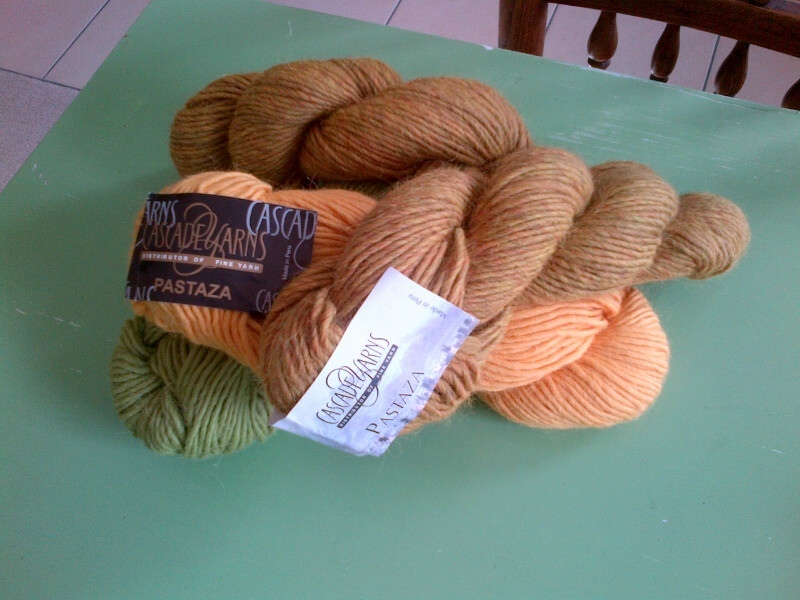 My first favourite for a smooth felt is Pastaza by Cascade yarns which with llama content is a, rather luxurious, perfect felting yarn but now, sadly, becoming out of supply. It was used in the red shopper at the top and the green handbag below. For a good robust carpet bag texture I recommend Icelandic Lopi available from Meadow Yarns in the UK. It comes in beautiful colours and is a good texture to work with. It comes out of the washer slightly too fluffy but shaves to a really strong fabric. The carpet bag below is made in this. Occasionally you can get good results with a mixed fibre. The striped bag below was made to a Noro pattern available in the Noro Unlimited booklet using Noro Silk Garden which has silk content. 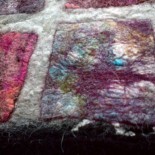 But be warned, working with Noro can be hard work as I had to manipulate the colour changes. Silk Garden only normally achieves a partial felt and a lot of fluff and chaff came out in the washer so it required a lot of work. The colours and patterns are beautiful. In the UK you can find Noro patterns and yarns on the Laughing Hens site amongst others. Beware of knitted handles! However good they look in the pattern they tend to stretch. 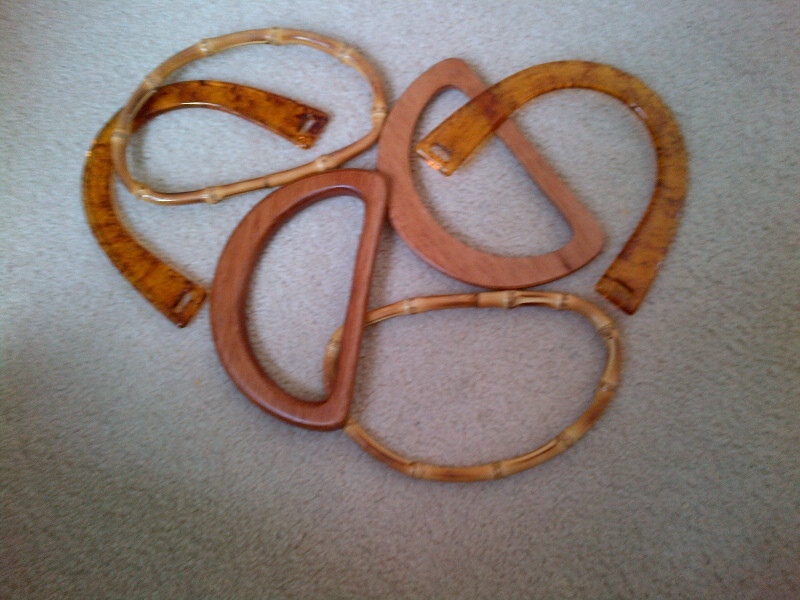 I reinforced the handles in the pattern above with the plastic webbing which came round the legs of a new chair. 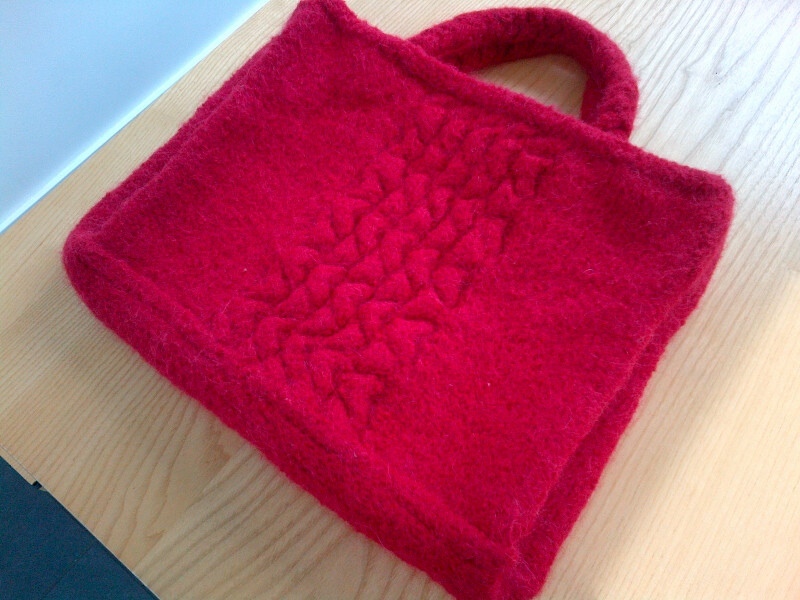 When making the red shopper I twice knitted three rope strands and plaited and then felted them to give me two strong handles. The pattern showed single rope strands which I fully expected to stretch. I have no commercial interest in the commercial sites mentioned here. All are good UK suppliers. Your bags really are beautiful Liz. I particularly like the carpet bag, it looks very professional. Be sure to post a photo of your blue bag when you get it finished. It’s an addiction but there are worse addictions. Somehow I don’t like knitting things to wear. Anyway thank you for following me and for saying so. I like the things you are doing a lot.